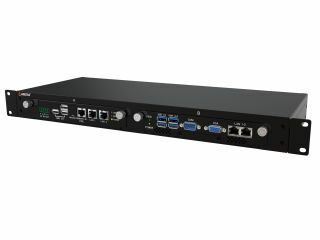 The What: Arista Corporation has launched the RS-122 Universal 1RU Rackmount System with Dual HDBaseT, AV Over IP, and computer options. The What Else: The RS-122 is designed to accommodate any two of five available swappable modules: (1) the MicroBox-1100A-E01 computer, (2) the ARD-1006-A07-TX HDBaseT transmitter, (3) ARD-1006-A07-RX HDBaseT receiver, (4) the ARD-1006-A31-TX AV-over-IP transmitter, and (5) the ARD-1006-A31-RX AV-over-IP receiver. The system enables integrators to determine which combination of transmitters and receivers should be placed in the system’s 1RU, 19-inch rackmount housing—with or without the PC controller module. This design approach facilitates the greatest flexibility for today’s sophisticated AV systems while it also simplifies the time and effort it takes for maintenance or system upgrades. Arista’s MicroBox-1100A-E01 computer module features an Intel Atom E3845 1.9GHz quad-core CPU and up to 8GB DDR3 memory. The system is capable of running Microsoft Windows or the open-source Linux operating system. Accessible ports on the front of the MicroBox-1100A-E01 include a four port USB 3.0 hub, dual Gigabit Ethernet, one RS-232/422/485 BIOS selectable COM port, a CFast slot, and a VGA port. The unit’s rear accessible ports include one HDMI port, one USB 2.0 connector, one RS-232/422/485 BIOS selectable COM port, an audio out jack, and a power on/off switch. The Arista ARD-1006-A07-TX HDBaseT transmitter module features an HDMI Loopback output, a two-port 10/100Mbps Ethernet pass-through hub, IR control, plus Power over HDBaseT. The unit transmits video signals up to 4K/UHD with embedded multichannel audio and remote power for the receiver. The Arista ARD-1006-A07-RX HDBaseT receiver features a four-port USB 2.0 hub and a two-port 10/100Mbps Ethernet pass-through hub, along with an RS-232 port and IR control. Other module options also available are the Arista ARD-1006-A31-TX a 4K/60 4:4:4 AV-over-IP transmitter and the ARD-1006-A31-RX 4K/60 4:4:4 AV-over-IP receiver. These units deliver uncompressed, low-latency signal with broadcast-quality scaling. They are suited for applications that require high-quality, low-latency video extension. These units’ attributes include HDMI 2.0, HDR video, windowing and audio downmixing, audio embedding/de-embedding, and more. The Bottom Line: Designed for applications where computers and extenders can be configured dynamically, the RS-122 is well suited for for control rooms, live event production, and similar uses, and is expected to be available in April 2018. MSRP pricing ranges from $790 to $1500, depending upon the configuration of the equipment.